We are excited to announce the approval of our own private dock to provide door to door VIP pick up from the airport, restaurants and tourist attractions available to all owners and guests with our private water taxi concierge. With only a few remaining Residences for sale, we invite you to visit us on site to view our model unit now ready for private viewings! Luxury lifestyle in the Caribbean. Grand Cayman is the largest of the three islands which make up the Cayman Islands, located in the central Caribbean. A stable British overseas territory with no direct taxation and a sophisticated infrastructure unique to the Caribbean, Grand Cayman is a thriving offshore financial center. Crystal clear waters and white sandy beaches are found alongside all of today's modern luxuries including fine-dining, exceptional land and sea activities, superior healthcare and education, modern amenities and duty-free shopping. With the perfect combination of modern business and a quaint, relaxed, island culture, Cayman attracts wealthy and sophisticated tourists by sea and by air. During the Winter season the Cayman Islands have over 100 direct weekly flights from 16 major markets including: London, Miami, New York, Houston, Chicago, Toronto, Atlanta and Charlotte. The Cayman Islands are truly an incredible place to visit, live and work. Each residence will be furnished with the finest fittings and fixtures including Thermador, Miele and Wolf luxury kitchen appliances, LED recessed lighting, Sonneman vanity lights, Nameek and Kohler fixtures and Electrolux laundry appliances. With gorgeous porcelain tiling throughout each unit, ceiling heights of almost 10 feet and balconies framed with tempered glass balustrades, the Rum Point Club Residences offer world-class design within a beautiful Caribbean setting. The Rum Point Club Residences overlook 500 feet of pristine beach in the unspoiled North Side district of Grand Cayman. The Residences will feature a fully-equipped fitness center, spa, beachfront infinity pool, underground parking and dock rental for private boat or wave runner use. The five-story complex will boast hurricane-resistant construction, including Miami-Dade level impact resistant doors and windows. Whether for a holiday getaway or a long-term retreat, enjoy the lifestyle you deserve at The Rum Point Club Residences. 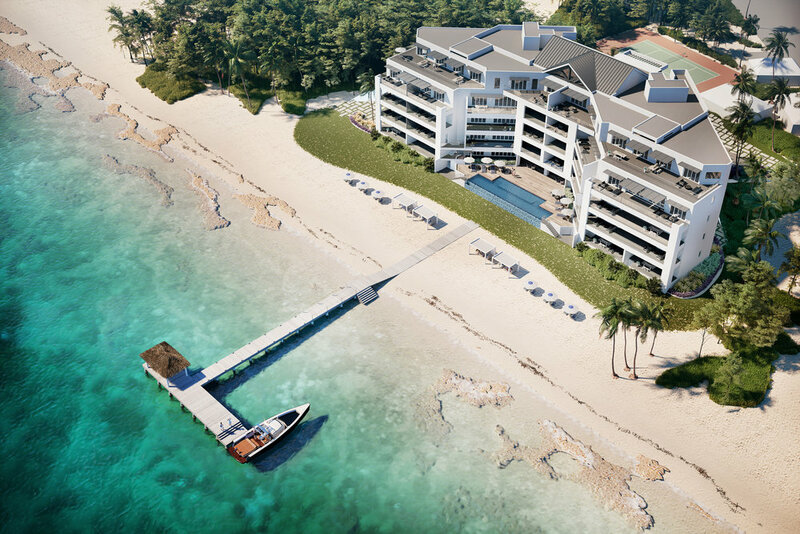 The Rum Point Club Residences are new luxury beachfront condominiums located in the secluded community of Rum Point, Grand Cayman, just a 45 minute drive from George Town, the capital and financial center of the Cayman Islands. The Rum Point Club Residences are accessible by car or by boat. The Rum Point Club ferry transits the North Sound four times per day and takes only 15 minutes depositing passengers to the Rum Point dock, a three minute walk to the residences. The district of Rum Point is the epitome of island life. With its relaxing beaches, quiet neighborhoods and laid-back lifestyle, this new development combines idyllic Caribbean tranquility with modern luxury living. The developer, Joseph Imparato, has resided in the Cayman Islands for more than 38 years and is well known in both the civic and business communities. Quality, integrity and success are words often associated with projects in which Joseph has been involved, including his three most recent developments - Caribbean Club, Caribbean Plaza, and the Fidelity Centre. Joseph's other successful developments in the Cayman Islands include Marquee Plaza, Buckingham Square, Madison Place, West Shore Center and Galleria Plaza.